If you’re considering a holiday in Africa and your focus is to see as much wildlife as possible, then what’s the ultimate destination to visit? Enchanting Travels’ Managing Director Florian Keller gives one simple answer: A classic safari in east Africa to see the Great Migration of course! With your own bare eyes – and a handy pair of binoculars, naturally – you can spot hundreds of thousands of wildebeest, zebra and gazelles on the iconic Savannah. 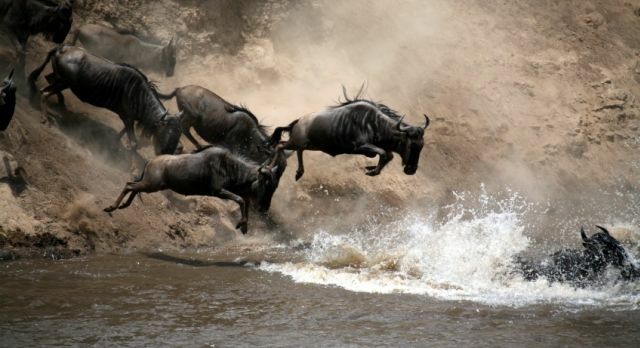 The most spectacular time to observe this spectacle is during the months of August to September when thousands of wildebeest and zebras cross the crocodile-infested Mara river. For nature lovers and wildlife enthusiasts alike this is a “bottoms-on-the-edge-of-your-seats” moment. It’s the perfect time of year to go on a classic African safari! The Great Migration occurs due to the animals’ simple need for food – moving onward with the seasonal rains as they act as natural lawnmowers and turn what, before they arrive, is up to man-high green and golden prairie, into short stubs of grass. It’s the moment where you see nature at its most raw – where survival of the fittest and the food chain is at the forefront of any observer’s mind. It’s not unknown for Enchanting Travels’ guests visiting during this time to say that their hearts beat a little faster or that a breath was missed as the animals swim cross the river and desperately try to climb up the steep riverbanks while gigantic Nile crocodiles approach them for a deadly attack. 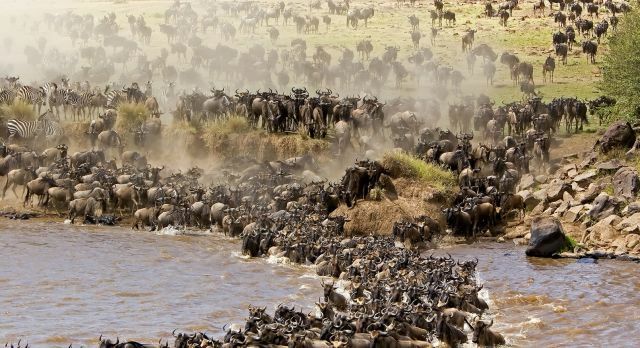 The Great Migration occurs within two national parks – the Serengeti in Tanzania and the bordering Masai Mara in Kenya. Both parks are considered among the finest wildlife sanctuaries in the world, with a vast collection of plains game, large herds of elephants and graceful giraffes as well as predators such as leopards, lions and cheetahs for whom the migration resembles a feast. Enjoy this incredibly unique and special seasonal Great Migration safari in Africa with a private, tailor-made adventure with Enchanting Travels. For inspiration, view our sample itinerary Kenya and Tanzania: Highlights! Or simply get in touch with us to plan your own private, tailor-made East Africa tour.